As just about every mobile device (especially tablet) usage metric attests, gaming is the killer app of mobile. Sure, casual gaming has always been a quiet power on the desktop. But the icon-driven, semi-lean-back tablet platform puts traditional media and other brands in direct competition with the most alluring icons on any device -- Candy Crush Saga, Cut the Rope, et. al. Worse, once a user taps into these experiences, she is not likely to come out soon. This is a mindshare battle over very different tasks often being waged during those most leisurely hours. And so media companies need to think harder about how they more literally “gamify” a wider range of content experiences. 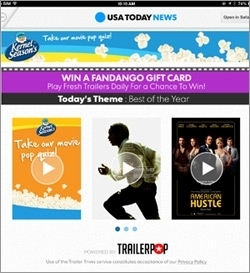 This is what USA Today is doing by incorporating the mobile trivia game Trailerpop into its iPad experience. Trailerpop was launched earlier last year as en entertainment trivia game and movie discovery/marketing platform. It has been a stand-alone app that essentially has users “play” a trailer by posing trivia questions as they watch. USA Today is pulling a version of the gameplay into its iPad app as “Trailer Trivia.” Kernel Season's is the launch sponsor. Gameplay is incentivized via sweepstakes promotions for users. Trailerpop founder Jon Vlassopulos tells me that this is the company’s first syndication agreement. But it has built the platform with turnkey on-boarding in mind. More partnerships are forthcoming. Trailerpop sold the first sponsorship for the feature, but Vlassopulos says USA Today is leading the sales effort. For Trailerpop, of course, this kind of syndication deal addresses one of its key challenges, distribution and discovery in a cluttered app gaming environment. The monstrous reach of QuizUp (claiming over 3.5 registered users) on iOS attests to the popularity of simple trivia gameplay on mobile platforms, but it also underscores the scale of Trailerpop’s competition. For an app publisher like USA Today, I am frankly surprised we haven’t seen more of this sort of deal. After all, the “puzzle page” has been a mainstay of the print newspaper for nearly a century. Even online, some brand media created gaming sections out of syndicated third-party titles. Much to some publishers’ chagrin, they would admit to me that some of their largest and stickiest site traffic was going to the “arcade” sections rather than their traditional content. For media apps on smartphones and tablets, the gaming imperative should be even more acute.